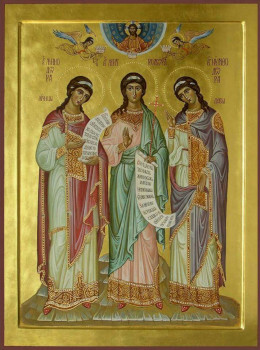 The Holy Virgins Menodora, Metrodora, and Nymphodora (305-311), were sisters by birth, and they were from Bithynia (Asia Minor). Distinguished for their especial piety, the Christian sisters wanted to preserve their virginity and avoid worldly association. They chose for themselves a solitary place in the wilderness and spent their lives in deeds of fasting and prayer. Reports about the holy life of the virgins soon spread about, since through their prayers healings of the sick began to occur. The Bithynia region was governed at that time by a governor named Frontonus, who gave orders to arrest the sisters and bring them before him. At first he tried to persuade them to renounce Christ, promising great honours and rewards. But the holy sisters steadfastly confessed their faith before him, rejecting all the suggestions of the governor, and declaring to him, that they did not value temporal earthly blessings, and that they were prepared to die for their Heavenly Bridegroom. Going into a rage, the governor took out his wrath on the eldest of them, Saint Menodora. The saint bravely endured the torments and finally, she cried out: “Lord Jesus Christ, joy of my heart, my hope, in peace receive Thou my soul!” And with these words she gave up her spirit to God. Four days later they brought to the court the younger sisters Metrodora and Nymphodora. They put before them the battered body of their elder sister to frighten them. The virgins wept over her, but they likewise remained steadfast. Then they subjected Saint Metrodora to torture. She died, crying out with her last breath to her beloved Lord Jesus Christ. Then they turned to the third sister Nymphodora. Before her lay the bruised bodies of her elder sisters. Frontonus hoped that this spectacle would intimidate the young virgin. Under pretense that he was charmed by her youth and beauty, he began amiably to urge her to worship the pagan gods, promising great rewards and honours. Saint Nymphodora rebuffed his words, and shared the fate of her older sisters. She was tortured to death with blows from iron rods. The bodies of the holy martyrs were to be burnt on a bonfire, but a strong rain extinguished the blazing fire, and lightning felled Frontonus and his servant. Christians took up the bodies of the holy sisters and reverently buried them at the so-called Warm Springs at Pythias (Bithynia). Part of the relics of the holy martyrs are preserved at Athos in the Pokrov-Protection cathedral of the Russian Panteleimon monastery, and the hand of Saint Metrodora is situated on the Holy Mountain in the monastery of the Pantocrator.